Before we begin your job search, we'll help you set up an account so you can sign in at any time. You'll also set up your backpack, which you'll use to save jobs, create a resume, and more. 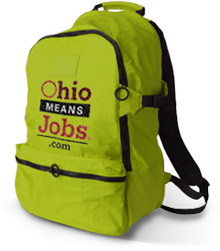 Looking for promoting material or guides for OhioMeansJobs? We have them listed in one place here. To find helpful occupation information, career videos, training providers, jobs and a lot more. In order to keep receiving benefits, you must complete several activities by certain dates. Planning for Your Future...Looking ahead is important for everyone, including students & parents.